In 1951 Christy celebrated its centenary, 100 years of the Royal Turkish towel. They still proudly carry an updated contemporary version of The Royal Turkish Towel in our collection today and it continues to be our most luxurious towel as it has for over 160 years. Special towels were produced to celebrate the Coronation of Queen Elizabeth II and then again to celebrate the Silver Jubilee in 1977. In 1988, Christy became the official towel supplier The Championships, Wimbledon. It is no surprise that the Christy towel used on Centre Court by the players has now become an iconic part of The Championships. Loyal Christy customers associate the style that is inherently British and known as a brand that has stood the test of time whilst evolving to meet the needs of customers. By embracing new yarn technologies, such as Hygro Cotton, and by producing season on-trend designs ensure they continue to innovate. 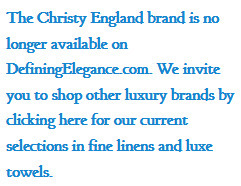 We are as excited by this brand today as their founders were in 1850 and we look forward to the future with as much enthusiasm for the Christy brand as ever.